AMS Council has unanimously voted to ban using posters to campaign in the society’s elections. This amendment, voted on at the April 3 Council meeting, comes after the use of posters was criticized for generating waste, consuming significant financial resources and requiring time-consuming efforts to ensure campaign regulations are followed. “[If it isn’t prohibited], I would train my successor to not allow postering,” she said before the code amendment was passed. 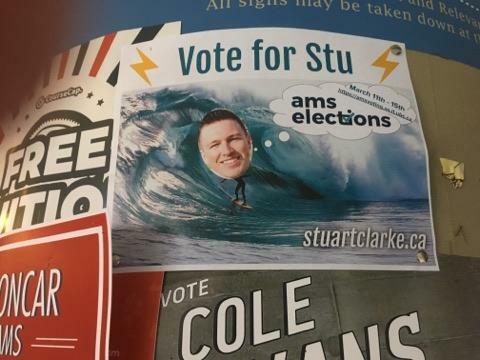 In fact, the previous elections committee led by outgoing AMS VP Academic and University Affairs Max Holmes in 2016/17 also recommended the abolition of posters as a means to campaign. Postering seems mundane. But the use of posters comes with its own unique set of challenges. Bertrand said most campaign violations in the past elections season were related to postering, and dealing with “minor” postering violations can divert focus from other important issues. “It's important for the elections administrator to focus on critical issues within an election, rather than the bureaucracy of regulating minor postering violations,” Bertrand said. Veteran AMS candidates say this is nothing new. Even during this campaign, many candidates reacted with anger and confusion over minor violations imposed for slight issues with their posters. "Over the years, the amount of pettiness that I've seen come out of postering — you'd be surprised,” said outgoing AMS President Marium Hamid at Council. Even weeks after the election’s conclusion, posters continued to remain on campus — despite existing financial penalties for candidates who don’t remove them by a set deadline. Board of Governors student representative Jeanie Malone also pointed out that posters are one of the largest costs of the campaign. But it isn’t just the direct cost of campaigning that raised concerns. Postering involves indirect costs too. According to Holmes, UBC Campus and Community Planning complains every year about paint “chipping off” the walls and poles due to adhesives used to hang the posters. He also claimed that during his time in the role, TransLink considered fining the AMS for posters placed at the bus loop, which is prohibited. “I had TransLink call me during my year. [They] threatened to fine the society for posters left up at the bus loop,” he said at the Council meeting. Holmes also highlighted that postering isn’t a sustainable means of campaigning as the society makes efforts to reduce its environmental impact. “We're supposed to be promoting sustainability, but we fund candidates printing up their posters and putting them around campus, which is not sustainable,” he said. “I am very pleased that AMS Council passed my Code amendment,” Bertrand said.